Ricardo Certification has confirmed the successful completion of an independent assessment of a new signalling technology developed by Beijing National Railway Research & Design Institute of Signal and Communication (CRSCD). Founded in 1953, CRSCD is a solely-funded subsidiary of China Railway Signal & Communication Company Ltd., and has established itself as a leader in China for safety control and information technology for rail transportation. During a ceremony held in CRSCD’s offices in Beijing, Iain Carmichael, MD of Ricardo’s rail business in Asia, presented the certificates for CRSCD’s European Train Control System (ETCS), lineside equipment unit and balise technologies, which are defined as interconnection components (ICs) in ‘COMMISSION REGULATION 2016/919’ on the TSI (Technical Specifications for Interoperability) relating to control-command and signalling. From initial application to the final issue of the certificates, the entire assessment process - which extended across design and production phase - was completed in just seven months. These are the first domestically developed signalling products to have been assessed by Ricardo’s team against the European TSI standards, and their successful certification means they can now be considered for application in the European market. 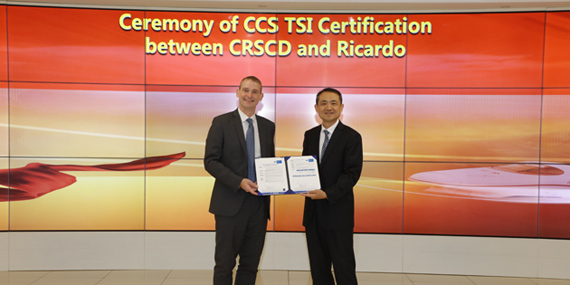 The successful completion of this certification against the comprehensive TSI requirements demonstrates Ricardo’s ability to help China’s manufacturers meet the necessary standards required for international markets. For many years, China’s rail networks used imported train control technologies to manage the safe operation of rail traffic. In recent years, however, the national government has encouraged the development of a burgeoning domestic rail products industry that has proven capable of producing such technologies to consistently high standards. This work is just one of the many ways in which Ricardo’s rail and certification specialists are assisting rail technology innovators in all parts of the world, in certifying products for the most demanding of world markets.